Let’s talk turkey! Thanksgiving is just around the corner, and cooks across the country are preparing their holiday menus. If you’re like me, you look forward to planning and cooking this meal all year long. I don’t even mind the chaos at my local farmer’s market a day or so before the holiday where throngs of people are filling their carts to capacity with all the fixings. I have a small family, so our Thanksgiving feast doesn’t quite match those for larger gatherings. A 12 to 15-pound turkey would yield leftovers that would fatigue even our healthy appetites. 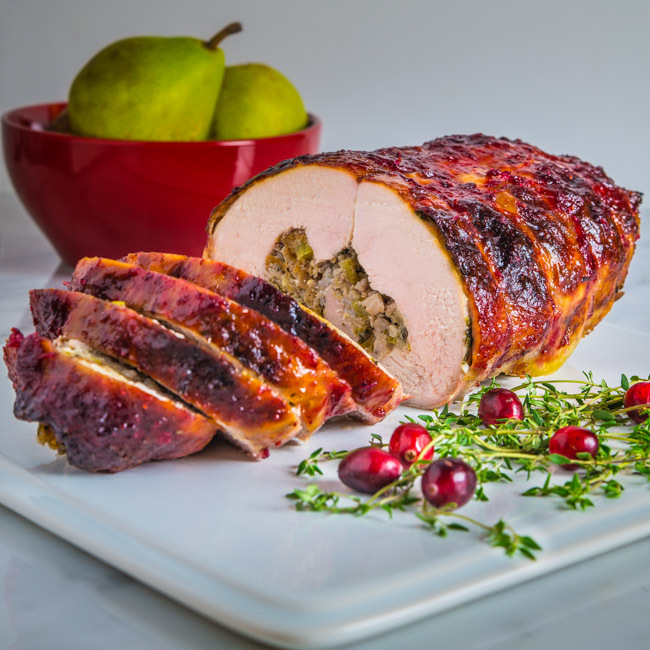 Personally, I’m just as enthusiastic about the sides as I am the turkey, so this stuffed turkey breast works perfectly for our smaller-scale dinner. Another advantage of this main course is that it doesn’t require hours of roasting time. You can put it together in 30 minutes and in less than two hours, dinner is ready. Additionally, carving is a cinch; just slice and serve. The stuffing contains leeks, pears, and sausage, some of my favorite Thanksgiving ingredients. If you’re not cooking for a houseful of friends and family, consider simplifying the main course with this stuffed turkey breast. You’ll still be enjoying a delicious turkey and stuffing dinner, without all the fuss. 1. Heat olive oil in a large skillet over medium high heat. Transfer celery, leeks, and garlic to skillet and saute for 2 to 3 minutes, stirring regularly. Add pears and cook for 1 minute. 2. Add sausage and cook until browned, using a fork or spatula to break break into pieces. Add sage, parsley, thyme, bread, chicken stock, salt, and pepper. Mix well and remove from heat. Blend butter, thyme, marjoram, sage, garlic, and salt together with a fork. Bring cranberries, maple syrup, and water to a boil in a small sauce pan. Reduce heat and simmer for 10 to 12 minutes until cranberries are soft. Remove from heat and cool. When cooled, blend with an immersion blender or food processor until smooth. 2. Place turkey breast skin side up on a cutting board. Slide your fingers under the skin to separate it from the meat. Place herb butter under the skin and press on the skin to spread the butter around. 3. Turn breast over. If breast is uneven in thickness, cover with plastic wrap and pound thicker parts with a kitchen mallet or rolling pin. Remove plastic wrap and spread stuffing over the breast leaving a 1-inch border. Roll breast tightly from one short side to the other, pressing stuffing in as you roll. Tie with about 5 or 6 pieces of evenly-spaced kitchen twine to secure. Season outside of roll with salt and pepper. 4. Arrange carrots, onion, and celery in a large ovenproof skillet or baking dish. Season vegetables with salt. Place stuffed breast on top of vegetables. Pour chicken stock into skillet and place in oven. 5. Bake for 75 to 90 minutes or until internal temperature reaches 155 to 160 degrees. Cooking time will vary according to size of breast. Baste with chicken stock every 15 minutes for the first 45 minutes. Forty-five minutes into cooking time, brush glaze over breast. Repeat every 15 minutes until breast is done. Remove twine before the last glaze. Remove from oven, cover with foil, and let rest for 10 minutes. The internal temperature should rise to 165 degrees. Slice and serve with gravy. 1. Strain residual stock from skillet and skim off excess fat. Add additional chicken stock, if needed, to equal 1 1/2 cups. 2. Melt butter in small skillet over medium heat. Add flour and whisk until incorporated. Cook for 2 minutes, whisking regularly. Slowly add stock whisking until well combined. Add Pear Brandy, reduce heat, and simmer until gravy thickens. Season with salt and pepper to taste. First – let me congratulate you on a really excellent and clearly presented lesson. Plus, this sounds darn tasty. I am with you about this being perfect for a smaller family. This year it will be just Bart and me for the Thanksgiving feast, and I too will do a stuffed turkey breast. Congratulations on a terrific article, and Happy Thanksgiving to you and yours. Terrific way to use turkey breast! Although I like the leftovers even more than the main meal, so I always opt for a big turkey. However, we serve turkey often during the year (we like it! ), so this would be great for one of those times for us. Good recipe — thanks. Hey Bill – I have been running like crazy. I have been following along, but I had to stop for a minute and tell you that this looks amazing (as do all your recipes)! Let’s catch up after the holiday. Happy Thanksgiving! This looks sooo fantastic Bill! I would love this for Thanksgiving!